If you're looking for a natural waxing alternative, Moom is for you! 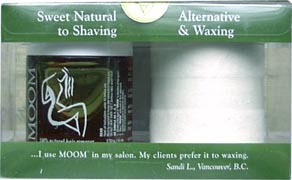 Now you can remove hair without painful waxing and damaging your skin – Moom gently removes hair from the root, cleans hair follicles, and puts an end to ingrown hairs, leaving your skin hair free and silky smooth for up to 8 weeks. Water-soluble formula is made only of sugar, water, lemon juice, chamomile and tea tree oil so there's no toxic compounds to irritate sensitive skin. This kit contains all you need to get started – it contains one 6oz. jar of Moom hair remover, 12 large and 6 small fabric strip, and 8 applicators (2 large and 6 small.) $16.99 per kit. Ingredients: Sugar, water, chamomile, lemon and Tea Tree oil. There are absolutely no chemicals, perfumes, or artificial substances in MOOM. Colour is completely natural and results from the development process. From Leann Zarate of Sullivan city, Texas on 10/29/2016 . This wax made my strawberry legs go bye bye! Oh my gosh. My leg hairs are black and course, so when I shave or wax I always get dark pores that never go away. But this wax has given me a new view on my legs. I began to love my legs again after finding this wax. They look smooth and the skin that i waxed is a lot more smoother than areas I have not done it. Yes it takes practice. A little does go a long way so try to lather small amounts on an area at a time. The cloths are easy to clean as well and so is the wax. I highly recommend this product if you suffer from strawberry legs and have very course hairs. This wax... really works. I am not exaggerating. From Anna of Roseburg, Oregon on 9/3/2015 . I was super skeptical about this product considering I've tried to make my own "wax" using similar stuff and it was completely ineffective, but my hatred of shaving aided in my decision to try it. Let me tell ya, this works REALLY well! I tried an armpit first and when I tore the strip away and looked at it I was like, "NO WAY!" One application got just about everything and what the first swipe didnt get, I got by using the same strip again. It is really easy to rinse off whatever's left on your skin when you're done, it smells good, you don't have to get it lava hot in order for it to work, and you only need to apply it very sparingly so one tub will last forever. A+ product! This works like wax, but it's much easier to clean up. You don't even need soap. Plus, you can rest assured that it's vegan. From Sara of Carrboro, North Carolina on 4/10/2012 . This wax is fantastic! I will never shave my pits again. It took a few mishaps before I finally got it right but now that I have I'm a convert. This actually works better for me when I use a thicker layer of wax rather than the thin layer they suggest plus I nix the cornstarch. From Shana of Warwick, Rhode Island on 7/5/2010 .